The fan-shaped pattern featured on these return address labels will give all your letters and packages and intricately artistic look. The wave motif was created using tiny pinpoints on top of a bright yellow background. Those plain envelopes will suddenly have a cheerful and creative appearance thanks to this stylish finishing touch. However, you'll also be impressed by the incredible convenience of this product. Instead of that chicken-scratch handwriting on your outgoing mail, you simply stick on these self-adhesive labels personalized with your return address. 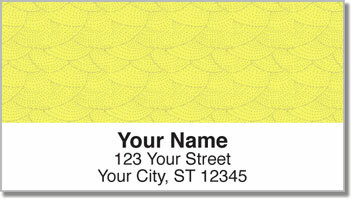 Order your very own Yellow Stipple Address Labels from CheckAdvantage today! You'll also find several other color options in this same design. Plus, get matching personal checks to make everything complete.